Micro-toning Facials use micro-current frequency to tighten and lift facial areas. This treatment has sometimes been called a "non-surgical facelift". Continued treatments work out all of the muscles of the face and can produce younger looking skin. The face is then infused with collagen, Vitimin C serum, and/or firming serum depending on the individual. The visible effects are very noticeable and give the client a fresh look. Energy Light Facial Rejuvenation is the future of skincare technology. 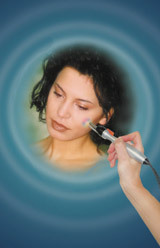 The Acutron Mentor, combines Microcurrent with Therapeutic Light and Color to provide a rejuvenation treatment that is unique. Facial acupuncture points and muscles are stimulated to tighten, lift and rejuvenate the face. A series of treatments results in a more youthful appearance which is achieved without surgery, needles, redness, flaking, downtime or discomfort. Facial Rejuvenation uses traditional Chinese medicine to treat skin from the inside out. The treatments balance qi, yin and yang in the body to achieve aesthetic goals. Small needles are inserted in specific areas to stimulate circulation, plump up fine lines and facial wrinkles, and boost collagen production.The results make this procedure an alternative to traditional face lifts, botox and dermal fillers. © 2019 Elements Natural Therapy.